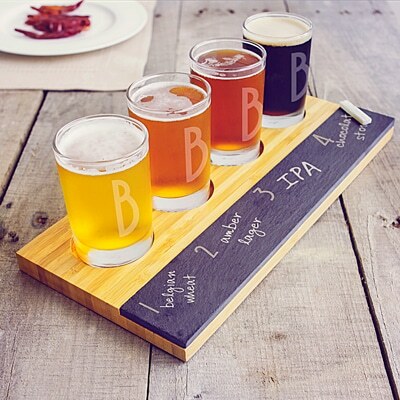 Sample your favorite beers with this awesome tasting set. Use the included chalk to write each beer’s name. We’ll engrave each glass in the set with an uppercase letter for no extra cost. The Personalized Bamboo & Chalkboard Beer Tasting Flight allows you to easily share and identify your favorite brews. The natural bamboo board is beautifully crafted and had an indention for each glass so there won’t be any spilling. There’s also a section of slate to write the names of your beers with the included piece of chalk. We’ll engrave an initial on each of the four glasses in your set. 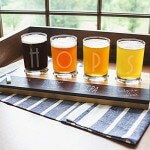 You can spell out a word (like BREW) or opt to have the same initial on each glass. 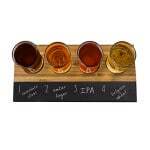 It’s an awesome gift for your favorite craft beer drinker. What are you waiting for? Get tasting! 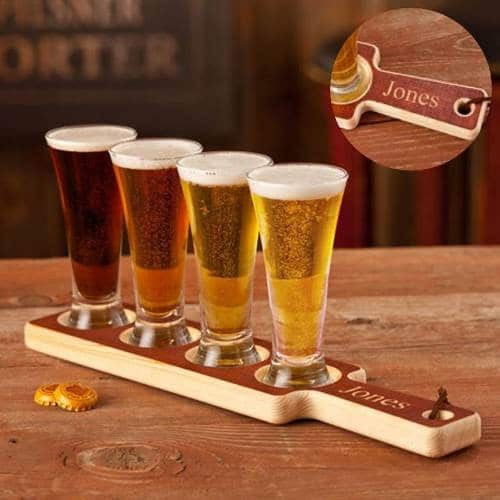 Taste your favorite beers in style! Set includes bamboo tasting board, (4) glasses & (1) piece of white chalk. Board measures 12.3" L x 5.7" W x .66" H.
Glasses measure 2.25" W x 3.5" H x 2.375" diameter, holds 5.5oz.